Save Messages is the main MessageSave window. This is what you use for most of your interactions with the application. Specify what messages you would like to save. 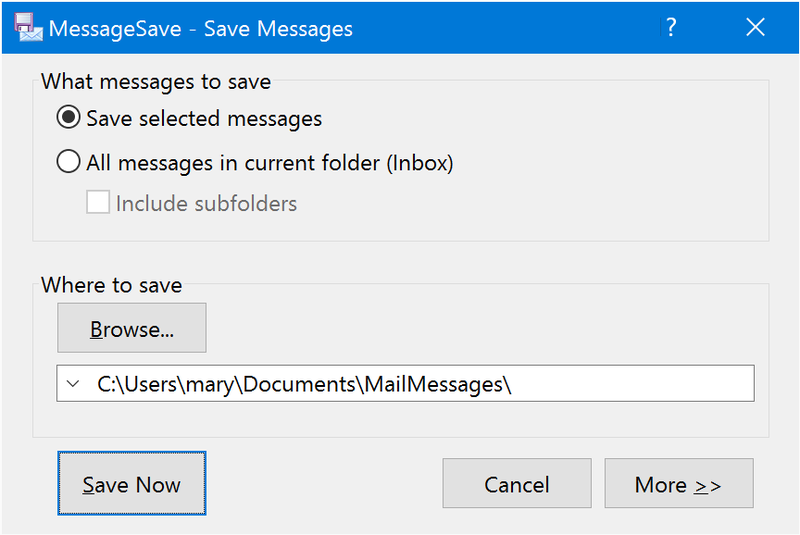 Save messages which you have highlighted in the Outlook message list before clicking on MessageSave. Save all messages in the currently open folder. 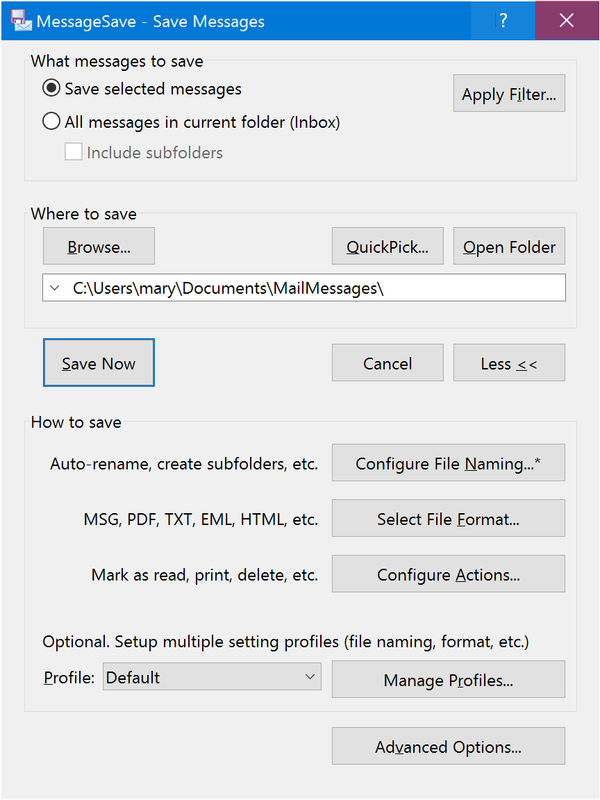 To save messages from a different Outlook folder, switch to that folder before opening MessageSave. Also save messages in all subfolders of the current folder. Opens the Filter tab of the Edit Profile window, which can be used to specify filter criteria for messages to be saved. Specify location for saving messages. This field has a drop-down which stores recently used folders for quick access. Open a Select Folder window to specify destination folder. Open the “QuickPick” window to select a destination folder from a list of previously used folders or folders pre-configured by a system administrator. Open the Destination Folder in Windows File Explorer. Show the smaller, more streamlined version of the window. Show the expanded version of the window with additional options. Opens the Naming tab of the Edit Profile window. Use it to configure file and folder naming for saved files. MessageSave can automatically rename saved messages to match your naming convention, so you do not have to rename them manually one at a time. Opens the Format tab of the Edit Profile window. Use it to specify file format for saved files. Opens the Actions tab of the Edit Profile window. Use it to configure actions such as mark messages as read, removing, assigning a category, running a custom script, etc. MessageSave supports a concept of “Settings Profiles”. A profile is a set of options, such as file naming, file format, actions, etc. You can create multiple profiles to quickly switch between them. Opens the Advanced Options window.